My husband is a ‘born and bred’ Australian yet somehow managed to grow up without a healthy respect or appreciation for the ‘might’ of the Australian sun. This has always bemused me—as most Aussies (well at least the ones I’ve met in my 17 years in Australia) are super conscious to always ‘slip, slop and slap‘. Until we met, however, I’m pretty sure my husband had never worn sunscreen in his life. His attitude has changed over the years (and I now no longer have to chase him around the house trying to squirt sunscreen at him before he heads out for a surf), but he still (too) frequently forgets to put any on. I’ve tried every trick in the book to try to get the ‘sun safe’ message to stick; annual skin cancer check ups, brochures on sun damage, even plain old nagging, but none of them seemed to work. It was time to bring out the big guns! Finally with no other options left I knew I had to hit him where it hurt…his vanity. A few well staged ‘goodness your wrinkles are really starting to show’ and ‘the sun has really taken a hit on your face’ comments later and suddenly a vested interest was achieved! Finding a sunscreen product that works well in the surf is not however easy. Most come off too quickly, or start to run and irritate the eyes. Good old-fashioned zinc is the natural choice, but let’s face it, not too many people are happy to walk around (let alone surf) with zinc stripes on their face—unless they’re under six years old, or it’s Australia Day. 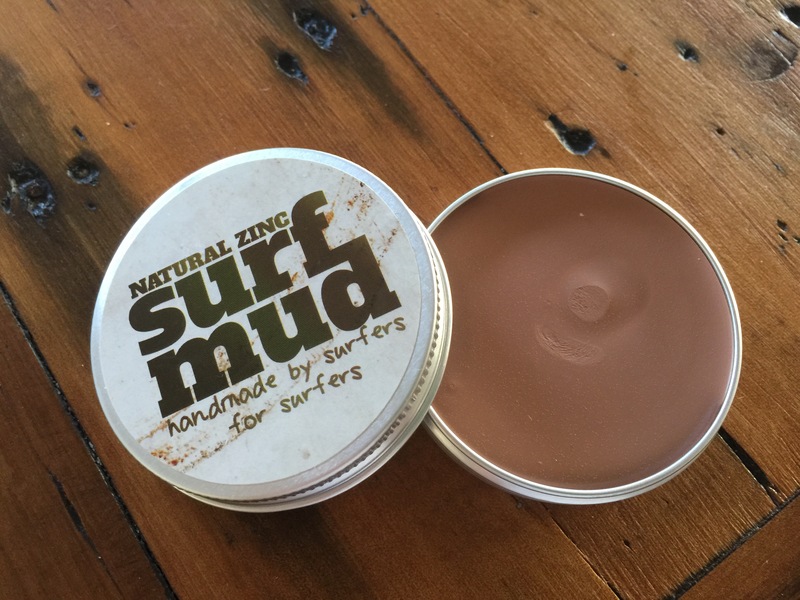 I felt like I’d struck gold then when I found Surf Mud at my (weekend) local health food store (Laneway, Cabarita). 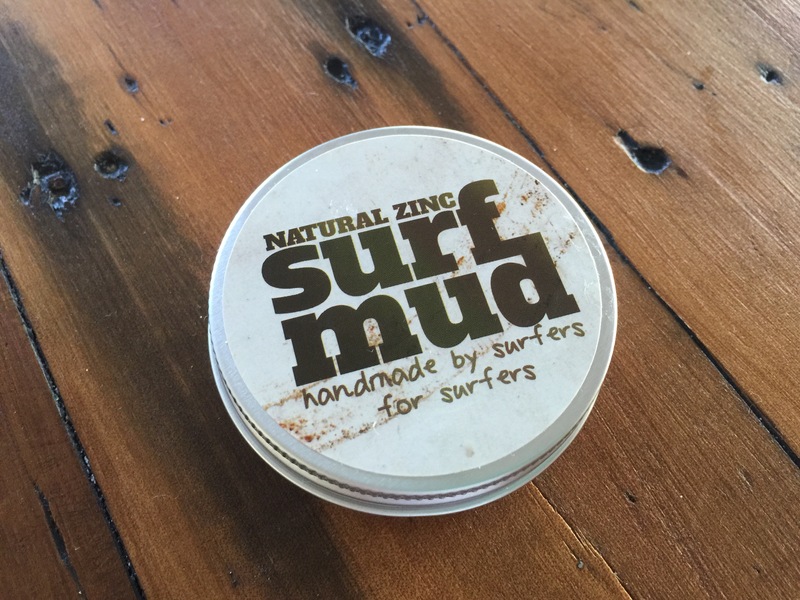 ‘Handmade’ by surfers for surfers, Surf Mud is a cruelty-free (tested on surfers, not animals) natural zinc cream that contains 28% zinc oxide (non-nano), providing all-day protection from UVA and UVB rays. All round perfection in a handy-sized metal tin. Convincing my husband to use it however was another matter. I see a skin-coloured cream and think ‘blemish coverage—great!’ He apparently sees a skin-coloured cream and thinks ‘makeup—that’s for girls’. After several rounds of ‘test’ applications at home—and total reassurance that it can’t be seen and no one will think he is wearing makeup—he has finally started using it. The application is simple, it blends in easily and does what it says, offering all day protection. It’s great for little Miss Seven as well, who no matter how much screen I put on her face always seems to end up with a rosy nose and cheeks after a day at the beach. Surf Mud however stays put for the whole time and keeps her face protected. Surf Mud is $19.95 for a 50g tin, and can be bought online (at Surfmud.com) or at selected retailers (mostly surf stores and health stores, check the Surf Mud website for stockists). Stay safe in the sun and give it a try.